Optimal valve angle and intake port positioning achieve maximum potential air/fuel flow around the circumference of the valves, for ultimate power potential. A mirrored valve configuration has been used with inline valves, this allows for a more compact intake manifold, which in turn makes for easier tuning and better throttle response thanks to the even distribution between the runners. The valve seats for intake and exhaust valves have been cut at 50 degrees to increase air/fuel flow at high lift. The exhaust flange pattern for the standard 4.400” bore space head has been designed to work with widely available 13 degree exhaust headers. Copper beryllium seats are standard. 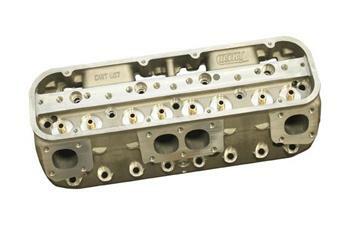 The flange for the front valve cover mount has been made taller, allowing for shorter valve covers. Provisions for extra head bolts have been added to each end, making for an improved seal. Non standard exhaust and valve cover patterns. 9 Degree heads sold bare, no assemblies available. All cylinder heads are sold individually.